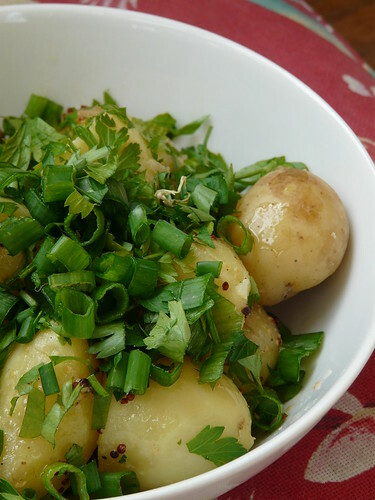 Boil some waxy new potatoes (skin on or off, whatever you please) until perfectly cooked. Cool. Toss with a dressing of 3 parts olive oil, 1 part cider vinegar and 1 part wholegrain mustard. Season and set aside for an hour or so. 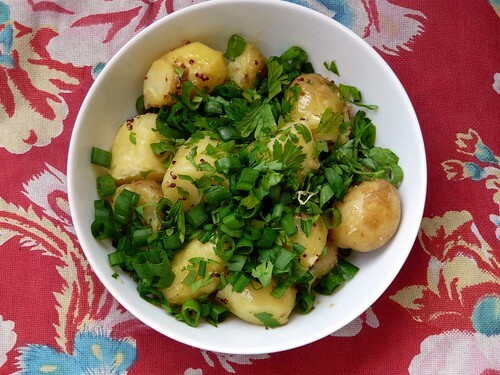 Serve topped generously with chopped spring onions and parsley. Try not to eat it all before lunch time . Looks fabulous….probably tastes even better. Looks pretty good … but potato salad without mayonnaise? Not sure I can do it – I love mayonnaise too much! This looks yum and the kids might think so too. Thanks! What a delicious version for this classic summer dish! I am going to try it next time!